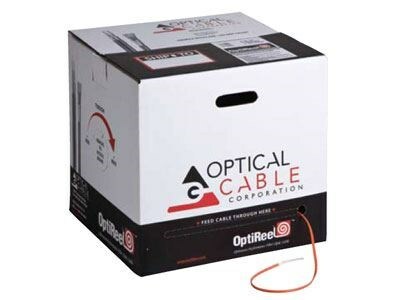 The Indoor / Outdoor 6 Fiber Distribution Cable - Multimode OM1 62.5 micron, Riser Rated - 1500FT tight-bound tight-buffered design allows cables to be installed in intra-building backbone and inter-building campus locations without costly transitions between cable types. 900 micron buffer eliminates the need for costly and time-consuming installation of fanout kits or pigtail splices because connectors terminate directly to the fiber. No need to splice outdoor cable to indoor cable at building entrance. High crush resistance may eliminate the need for innerduct. High performance components and construction.